The Serdaal Ballroom can accommodate up to 450 guests in gala dinner setup style. Ceiling height of 5.5 meters with 35 loading points that can hold up to 300 kgs per point. Built-in high standard AV & 5 LCD Projectors and dimmable lighting. 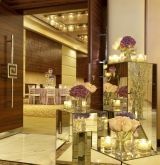 Our ballroom can be divided into 2 sections of 1/3 and 2/3, perfect for exclusive meeting and lunch or exhibition itself.